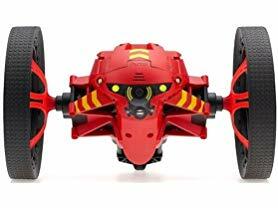 Today ONLY - this Parrot Jumping Night MiniDrone ONLY $26.99 (Retail $149.99). The Parrot Jumping Night is a next-generation minidrone that's responsive and full of life. Ultra-stable and easy to control, it's equipped with two powerful LEDs to explore the darkest corners and perform the boldest night-time acrobatics. What's more, you can produce many sound and light effects, and follow it through its on-board camera as if you were there. Experience thrilling sensations in real time! •The Parrot Jumping Night is a true explorer. Nothing can stop it. With its two LED lights, it can see and film anything, even in darkness. Nothing will escape you, as you'll be able to prove! •With a strong personality, the Parrot Jumping Night rolls, slaloms, turns, jumps, and reacts with sounds and lights depending on its mood. Take control of your minidrone and communicate through it via your smartphone's earpiece. Experience the action live! •Thanks to its excellent grip and road-holding, your Parrot Jumping Night performs extremely precise turns. Control it with your fingertips and easily carry out all the acrobatics pre-programmed in the FreeFlight Jumping app. It can make vertical and horizontal jumps of up to 80 cm, perform balancing acts, and even clear its path by throwing objects out of its way. •Equipped with a wide-angle camera streaming live video straight to your smartphone, you can view the world from new angles and explore previously inaccessible areas. By using the 'Road Plan' feature, program a series of acrobatic movements, sounds and lights for unlimited choreography that'll make you king of the road. •Parrot's nifty drones are packed with all the fun in the world and additional interactive opportunities : they offer unlimited learning possibilities in STEM and coding! They partner with Tynker, the leading code-learning platform used by more than 50 million kids. They have also developed an activity book for the amazing Apple Swift Playground. Finally, they have created a platform to share all those learning resources. Now you can easily teach and learn coding and problem solving in a game-like fashion!